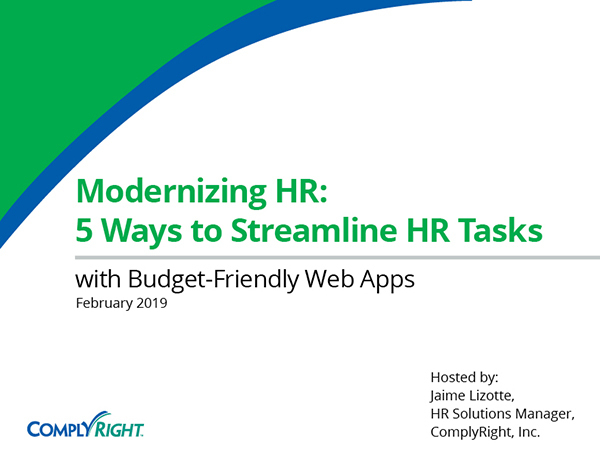 Hiring, recordkeeping, time and attendance tracking, employee discipline, filing 1099 and W2s … all of these tasks create overhead expenses and detract from revenue-generating activities. During our post-webinar Q&A session, Jaime Lizotte, HR Solutions Manager and Erica Korman, Marketing Manager, will answer questions on switching to cloud-based apps and choosing the right apps for your business. Is it $60 per app or do I need to purchase all of the apps to get that rate? No, it’s $60 per solution, per year whether you choose to purchase one or all of the apps. And of course, Employee Records is free. This also includes continuous updates and maintenance to your apps to meet regulatory compliance requirements — at no additional charge. We’ll automatically update your apps for you. Is Employee Records free for a trial period? Will I eventually be charged? No. Employee Records is completely free. There is no trial period, and you never have to pay. Does employee size affect the price of your apps? No. It’s the flat $60 per year regardless of employee count. With the online job application, can candidates also submit a resume? Yes, the Job Application App allows candidates to complete employment applications online and submit to you electronically. They can also attach a resume or cover letter with the application. How does the I-9 and W-4 app work? Do you email the forms to new employees? I-9 & W-4 app makes it very easy to complete new hire forms easily. You simply enter your employee’s name, email and hire date and the app will automatically email them a link to so they can get started filling out their forms. You can do this before their first day so they can show up to work on the first day ready to work. Then the app will guide them completing the forms properly. Tool tips explain what each field requires and the app won’t let them skip any required parts. You’ll be notified when the employee submits their forms so you can complete your portion, and you’ll get the same walk-through guidance. This is a huge help meeting government deadlines and completing the forms, especially Form I-9, correctly. Can I print out the company policies? I have employees without computer access. Yes. After you’ve finalized your policies in the Company Policies App, you can notify employees to view them online — or print them out to distribute. You have the option to distribute electronically or print out copies. It’s your choice. If I as the HR Manager subscribed to Attendance Calendar, is it $60.00 for each user per year? Can I add the managers, etc? Yes, you can add your managers or supervisors and give them access to their employee’s calendars. Again, regardless of your employee count or number of managers or users, the app is still just $60 a year. Period. Adding managers or more employees won’t affect your rate. Is there a better price if you bundle multiple apps vs 1 or 2 apps? We do have a special bundle offer available right now on for our Hiring apps, Job Application and Applicant Tracking. You can get both apps for $100, a $20 savings. This is a limited time offer, so jump on it now if you can. There is a special link for listeners of this podcast that will allow you to redeem this special offer. Is there a trial period so you can use the app for a while before you decide if you want to buy? Yes, we do have a 3-day trial for any app, excluding Poster Guard 1. Just email us at support@hrdirectapps.zendesk.com, let us know which app or apps you’d like to try, and we’ll get you set up.